This is a second 49 prototype body I bought to do something different with. 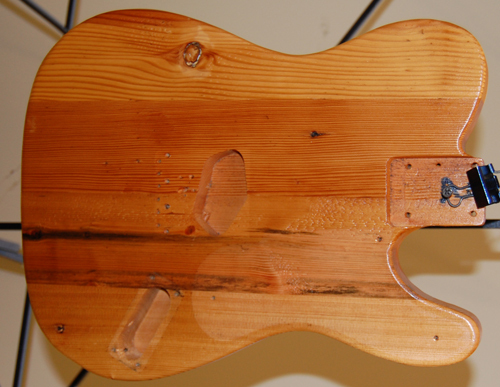 I will be aging it, but using nitrocellulose for a finish, more in line with the original guitars. I purchased the guitar at the same time I purchased the other prototype, they are fairly identical except in cosmetics. This one has way more flaws in it, such as nail holes, smears and the like. Some would call that defects, I would call it character. I have already aged the pine for 3 days with the pickguard and electronics cover on, for the purpose of giving it a "tan line", so you can see how much it has aged. Pine seems to take a little longer to age than hardwood, so we are only about half way done aging. At this stage (shown below) I have pulled it out and put about 4 coats of nitrocellulose finish, spray can type. Next we will put the pickguard back on and age it some more, then finish up the nitro, and age it back to make it look weathered. This might take awhile. How long, I don't know, that is what these experiments are for. I have noticed one goof on my part. I used some wood filler on a knot, and where it overflowed a bit, the guitar won't darken. See the knot near where your arm would rest. Live and learn, but this is why I do this. As you can see, we took a pretty plain slab made from several boards and gave it character with some exposure, and did it in just a few days at low wattage: 6 lamps at 32w each, Solacure SG-1-40 lamps.